In this eBook, you get 50 feats of mental magic from the legendary U. F. Grant. 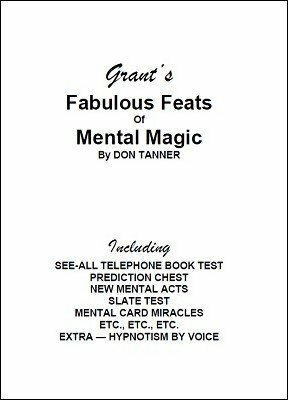 Written by Don Tanner, contents include book tests, various design duplication methods, Grant's original Prediction Chest, Q&A acts and methods, mental card miracles, blindfolds, and much more. Many of these items are worth far more than the price of the manuscript; including Grant's "Mental Epic" style triple prediction effect, called "Citation," that uses a large regular slate or dry erase board. You get all this for just $4.00, one of the best bargains in magic.